US: Before the show begins, how about we talk to one of the judges? Here we have none other than the most famous reindeer of all, Rudolph! Hi there, Rudy! You’re looking quite well after that unfortunate accident with the snow plow last winter. RR: Thanks, Peter! My glowing nose wasn’t much help that day. My face is still a little crooked, but I’m doing much better these days. US: Good to hear! So, do have any idea of who is gonna win this thing? RR: Well, to be honest, I came because I heard there would be free cookies. US: Really?… OK THEN… To the show. and the ever so posh “Scouts”. Between sets, we will be jammin’ to the fabulous tunes of DJ Sir Round Sound! And let’s not forget to introduce our special guests and judges: Nivaya Dragover and her posse! For our first act, we have the sisters known at “Bubble Bears” and what a cute duo they are. With their bubble gum sound and shiny attire to match, they are sure to be a hit! Such presence; Such talent! Oh but what’s this…. A squabble has erupted on stage and now their song has come to a screeching halt! Let’s head backstage and find out what went wrong. US: Hi there! You want to tell us what went wrong out there? BB Keytar: She is always trying to take the spotlight and get in my way! She won’t jump on my road to fame anymore cause I’m going solo! BB Singer (as outburst from the wings): Good, cause you don’t know how to play anyway! BB Keytar: Like you know anything with your out of tune self! BB Singer: Oh yeah? Well… YOUR FACE! US: *Nervous Laughter before a swift exit* Alrighty, good luck with that, girls! Next up, we have that savage trio known as “The Metal Bears”! With such raw, aggressive, teenage angst- driven lyrics, this one is sure to be a crowd pleaser. They arrive on the stage in their latex classically “rock and rock” black and red outfits and things are off to a great start as they bring the crowd to their feet! The audience is roaring with applause! Oh, and look at this! The lassie with the ‘Flying V’ guitar seems to be really trying to fly… right into the nonexistent mosh pit! Oooo… seems that the adrenaline rush was just too much. The Metal Bears will have to limp home with nothing more than a shattered dream and a broken nose. That’s two down and only one act left on the roster. With the competition knocked out, if they can hold it together and just make it to the end of this show with no disasters, they will instantly become Rockstars! Don’t let those cutesy sailor suits fool you. These ladies are FIERCE. As they burst into their first song, the audience remains unusually quiet, anxiously awaiting the outcome. Will they make it? Will they flop to their doom or will they be the next Rockstars? Upon receiving an enthusiastic nod of approval from the judges, we are proud to present the next Rockstars, “THE SCOUTS“! The audience goes wild! Cookies are thrown (sorry, Rudolph), chairs are turned over, people are fainting, the chaos is unreal! Congratulations, ladies! Let’s get them outside and onto their new tour bus, fully equipped with everything a person needs to live the life of a Rockstar! I know you’re all dying to know when you will get to see them live and in person, and I am pleased to tell you that your wait shan’t be long. They will be arriving at the Arcade on June 1st, along with all of the other contestants of our show! Due to the unforeseeable tragedies that occurred with our other contestants, we have decided to give them a second chance and let them go along on the tour as well… As long as the Bubble Bear sisters can refrain from pulling each other’s hair. (PAST EVENT) All of the bears featured in this article will be available throughout the month of June at the Arcade for only 25L per play. Once the month is out, they will be GONE. So be sure to get the collection before the end of June! 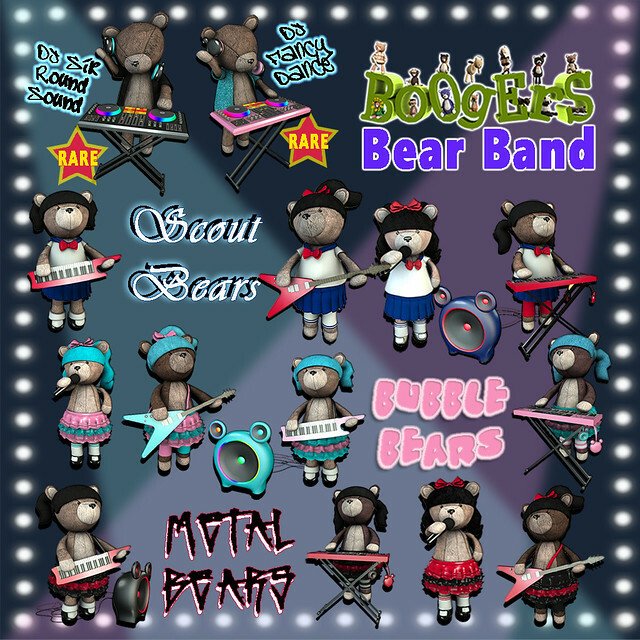 There are fifteen common band bears and two rares: Dj Sir Round Sound and DJ Fancy Dance. The customizable stage that you see the bears performing on is also available! However, this valuable prize must be obtained through the Arcade’s new Player Reward System. How it works: After 50 pulls on a specific gacha machine, the player will automatically be rewarded with the Player Reward. These Player Rewards are only available at participating machines bearing a gold frame that displays the item that will be given on the 50th pull.